Speedy Tuesday - Houston We've Had A Problem! 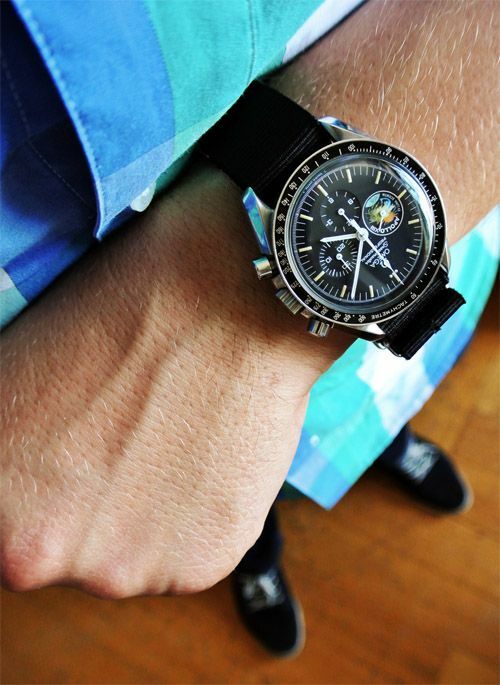 Speedy Tuesday is here! We recently received a number of photos from Balthasar de Pury, watch collector and Speedy fan. One of them is a Speedmaster Professional Apollo XIII that was introduced by Omega in 1995, to commemorate the Apollo 13 missions of 1970. Limited to 999 pieces only, this Apollo XIII 25th Anniversary model is one of the most wanted – if not the most wanted – mission patch model Speedy out there. On the 9 o’clock sub dial, the seconds indicator, there is this image of NASA’s Apollo 13 mission patch. Houston We’ve Had A Problem! Originally, the 1970 Apollo 13 mission was there to land on the Moon and to explore the Fra Mauro formation. We all know what happened though. The mission needed to be aborted because an incident occurred with one of the oxygen tanks and the crew just barely escaped from a fatal accident. Also in 1995, Apollo 13 – a movie based on the book Lost Moon – was released and covers the entire drama perfectly on screen. The book Lost Moon was written by one of the Apollo 13 astronauts, Jim Lovell (the other astronauts were Jack Swigert and Fred Haise). In the Apollo 13 movie, Tom Hanks (an avid Speedmaster wearer himself) plays the role of Jim Lovell, Kevin Bacon plays the role of Jack Swigert and Bill Paxton as Fred Haise. A movie definitely worth watching (again). Although Balthasar – the owner of the watch – wears his Apollo 13 Speedy on a velcro strap, the watch was sold with a reference 1479 bracelet (read more about Speedy bracelets here). 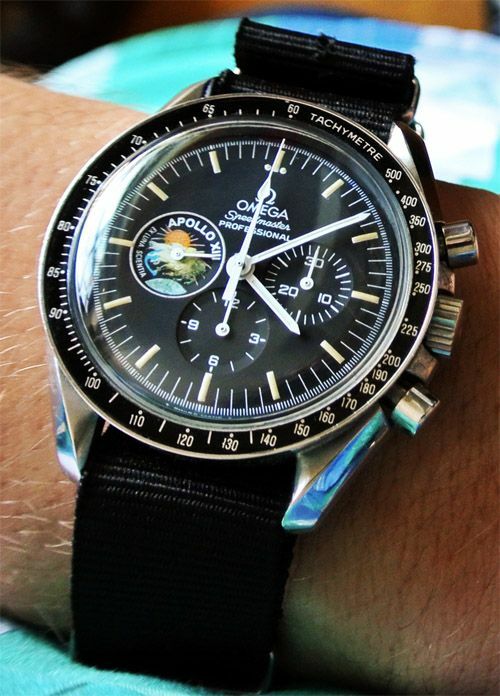 This Speedy model is actually one of the most desirable configurations, aside from the Apollo XIII patch. It still has the tritium dial and hands, the popular 1479 bracelet and the caliber 861 movement (changed to 1861 in 1997, as well as the tritium to Luminova). 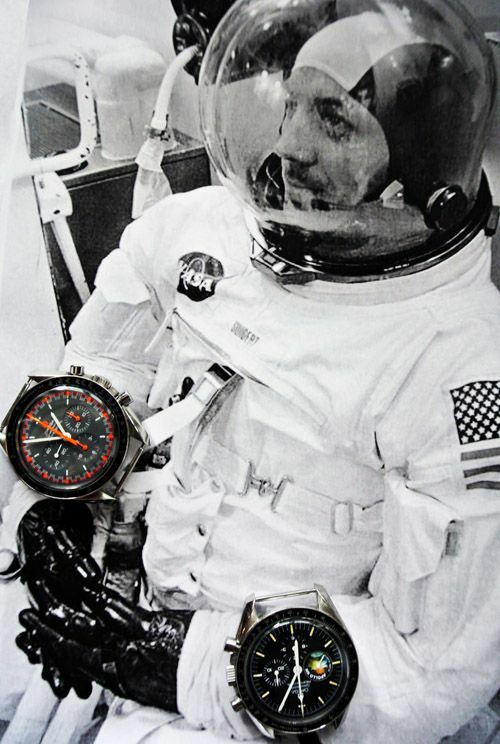 Thanks to Balthasar de Pury for sending us these pictures of his beloved Apollo XIII watch. The watch is not for sale, believe us, we tried.